I’ve been feeling this word of late. I’ve been cooped up just a bit too long. On top of that, today is the day we were suppose to leave for our trip back east. We had to cancel it because my husband was suppose to start a big job. Well, it was suppose to start in March and maybe even February…but as of yesterday, we found out the wait continues. Which means, of course, we could have taken our little vaca. Still needing to get out of this place. Even if it’s for a couple days. I hear Moab calling my name…. That’s why I love this page! When I design things, I have a vision of how I want to use them…or do use them…and I’m constantly blown away by my team with their own vision and creativity. And this page rocks! t’s no secret – we LOVE to travel! 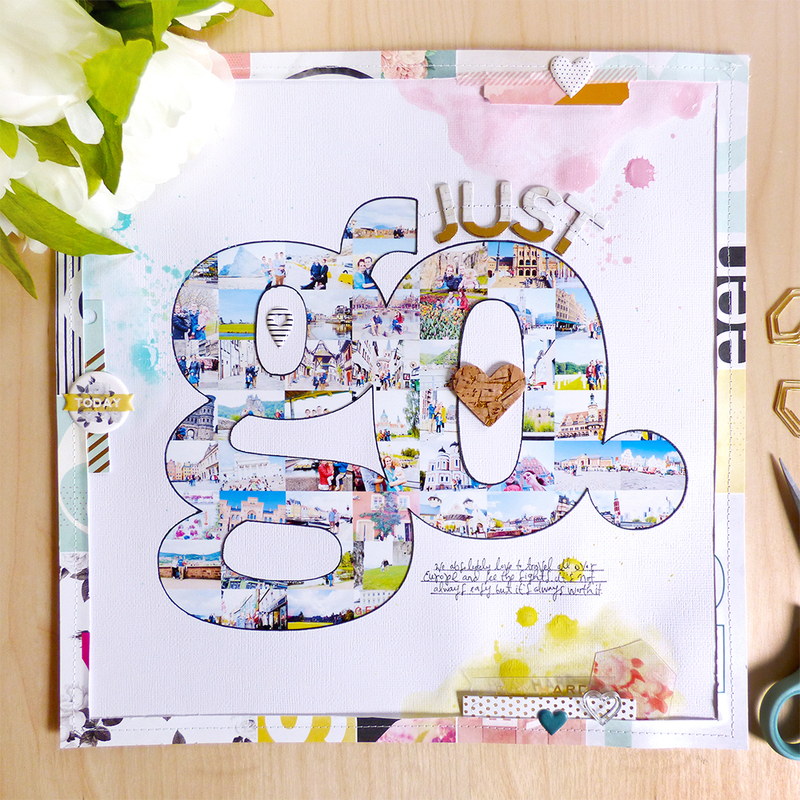 So when I saw the new “GO” stamp set and coordinating digital images I decided to make a layout that will be perfect as the opening page of our 2015 travels scrapbook! I die cut the “go” from white cardstock then outlined the inner and outer edges of the pieces with a black marker to help define the edges. 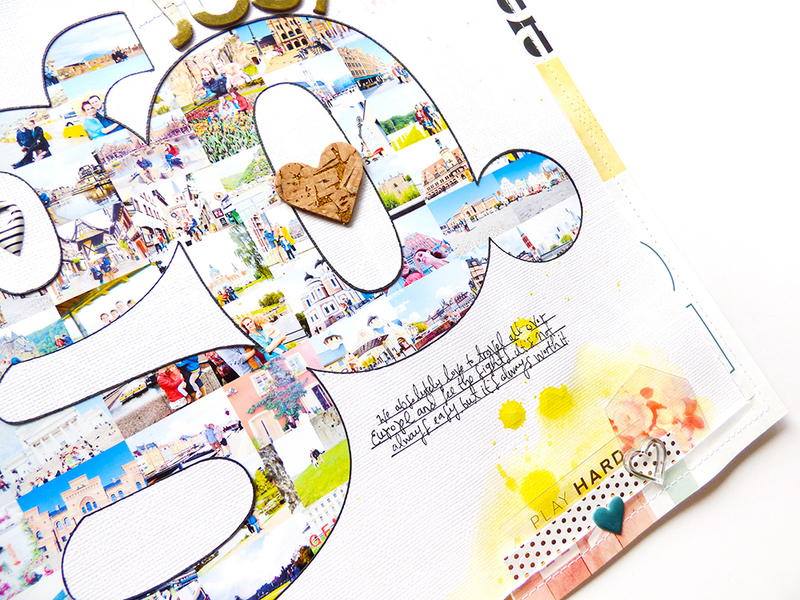 Next I printed a collage made from all of our 2015 travels and used that to back the die cut. 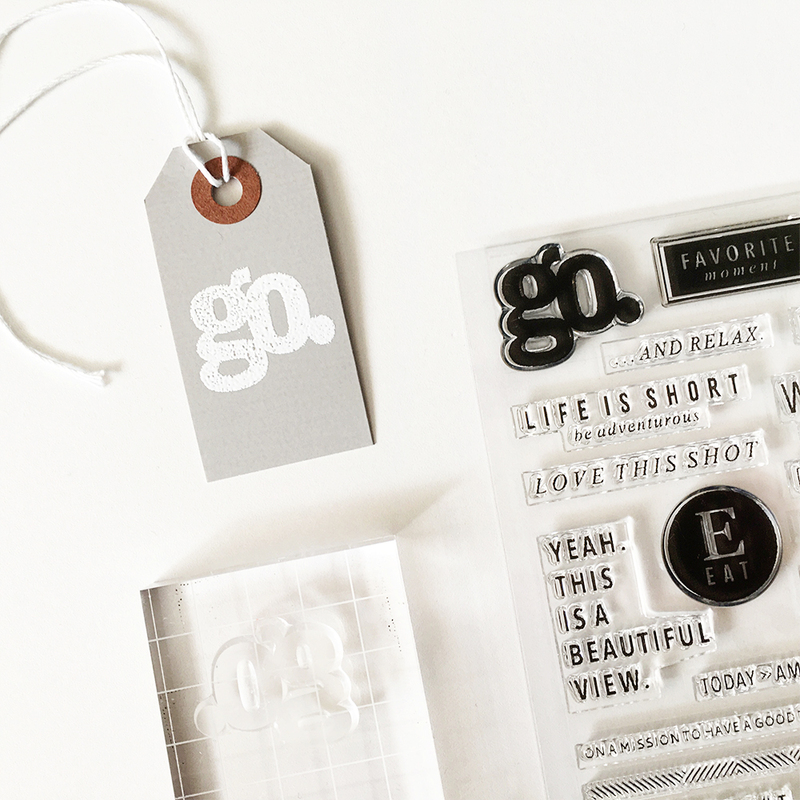 I used the positive “go” shape as a template to replace the inner pieces. Then I watercolored in three places to create a visual triangle using a pink, teal, and yellow pulled from the C’est La Vie collection by Pink Paislee. I trimmed a border from one of the C’est La Vie papers and stitched it on top. 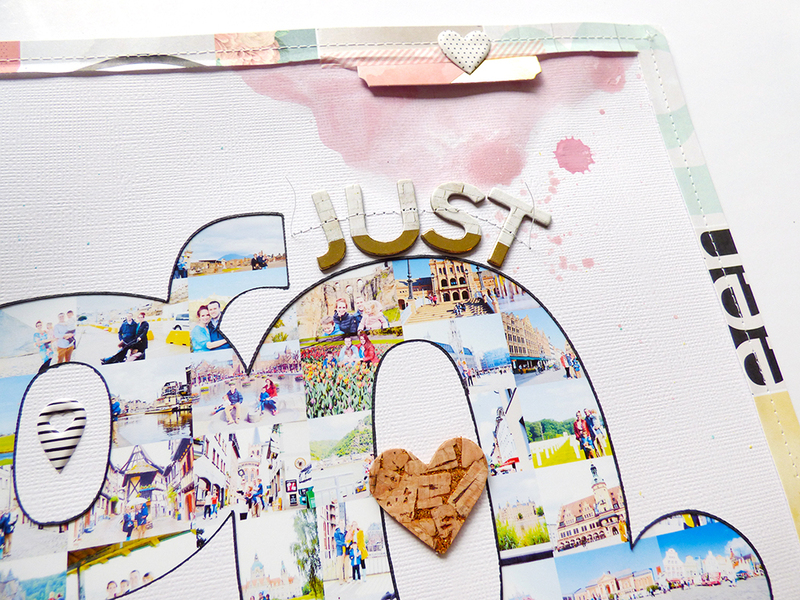 After adding a few embellishments to the watercolored areas I journaled below the title and stitched “JUST” chipboard letters above to finish! Just fabulous, right? 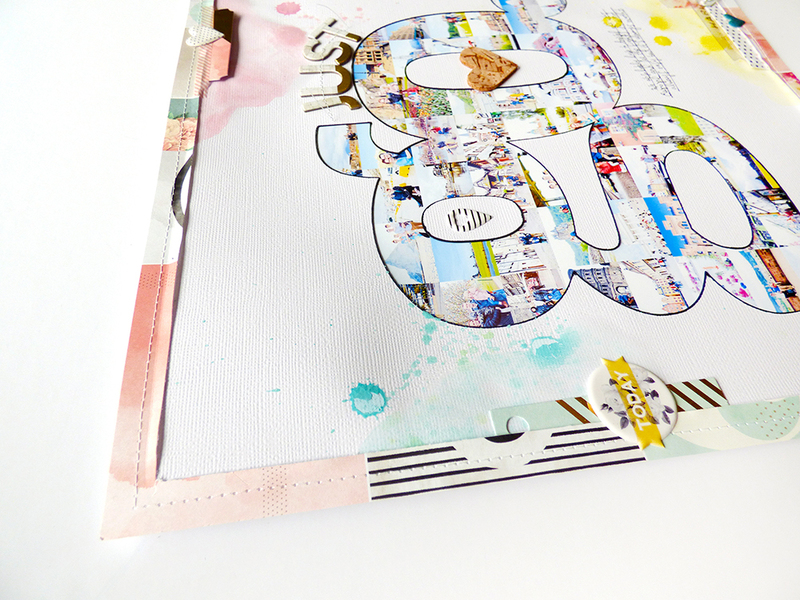 The tiny photo collage inside that ‘go’? Hello! Love it! And, oddly enough, yesterday I was playing with the physical Go stamp set. Just simply done. White embossing powder. That kind of thing. Always love me some tags. And now, I need to go…somewhere. Sorry about the cancelled vacation! Hopefully that big job will come through. I just had to say that I LOVE this page! Gorgeous. Yes i love this page , especially for all the extra pics i have, that i don’t know how to use them all. When you “go” , i know i get photo happy & take too many but who’s counting ?? ?..